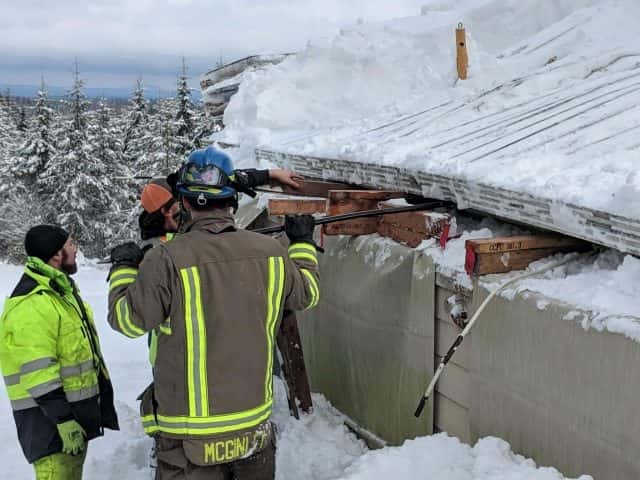 SEQUIM – An elderly Sequim man was trapped in a roof collapse near Sequim. About 9:45 yesterday morning, Clallam County Fire District 3 responded to 263 Sturdevant Road. They found an 85-year-old man who had his leg pinned under a roof collapse. They also discovered the victim was a long-time volunteer with department. The man had been clearing snow from his house when the porch roof collapsed. It took about an hour to get him out. Chief Ben Andrews says a county road crew had been plowing roads in the area at the time of the accident and were also able to help clear through the deep snow to the house. Due to waist deep snow, a snow-covered hill approaching his house, and snow packed county roads, the transport plan was complicated. The patient was hand carried in a stokes basket from the house down the steep roadway about 300 yards to a 4-wheel drive SUV. The patient was then loaded into the back of the SUV and driven to Fish Hatchery Road where he was transferred to an ambulance and driven to Sequim Valley Airport where the Navy helicopter flew him to Harborview Medical Center.